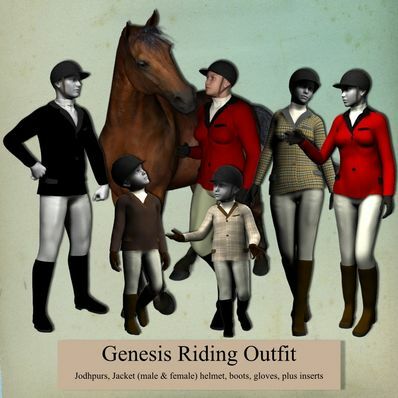 A complete riding outfit for Genesis for use in Daz Studio 4. Jodhpurs, Jacket (male & female), boots, helmet, gloves, plus two inserts for the jacket neck. Several textures included. Will work with most poses and shapes. This is what I was looking for so long! Congratz! You made me happy with this set - thank you soooo much! This is what I came here for! Thank you for giving horse lovers some love. Love your new site. Much easier than trying to find stuff on sharecg. Thanks again, love your creations.